Getting on the road at 16 or 17 can seem a long way off with the costs of getting a bike, getting insured, getting qualified and getting the right gear adding up. We’ve broken down the costs of getting your CBT a theory test and your first practical licence. The first cost that any new potential motorbike licence holder must face is sending off and paying for their provisional licence. This will set you back £34 if you apply online (or £43 by post) but this is by far the most worthwhile investment of your life when it comes to transport. As your provisional licence will cover you for every type of normal vehicle such as mopeds, 125cc motorcycles/scooters and cars but these will only be valid when you turn 17. When you are 16 the only vehicle your provisional licence will cover you for will be 50cc mopeds. The next cost involved will usually be for the Compulsory Basic Training (CBT). However when you book the CBT ensure you book it through an official and regulated body. The usual price of a CBT is around £89-£100. This price should include a full day of training, your CBT certificate, hire of moped/motorcycle, hire of helmet, gloves and waterproofs. Your CBT will be carried out among small class sizes so the instructors can focus more on progressing your ability. Another cost will be the motorcycle theory test, currently priced at £23. After you pass your theory test it’s on to one of your practical tests. There are a number of motorbike licences available and, as such, a number of different motorbike tests, too. They are all two-part practical tests and there are different eligibility criteria for each one dependent on age, experience and how recently you have passed your CBT and theory test. They range from a Moped licence, all the way up to an Unrestricted A licence. You can either pay for each part separately or for both, however the first part will always be an off road test, followed by the road test. The price for the off-road test is £15.50 while the road test costs £75 on week days and £88.50 on weekends or bank holidays. 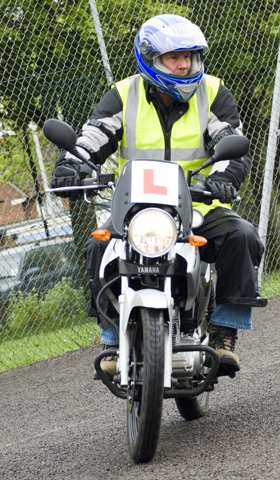 If you pass your practical test then your instructor will take your provisional licence and send it off for you and you should receive your full licence within a few weeks – you can ride your motorbike while you wait for the full licence to arrive. After all this, you’ve still got the expense of your scooter or motorbike, your helmet and protective gear. But with scooters available from as little as £500, it’s not too far off.